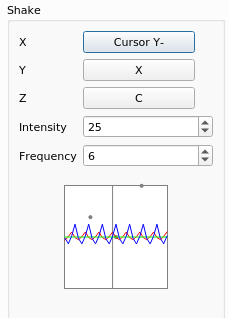 Frequency setting controls the approximate shakes per second. Intensity setting controls the total travel in centimeters. Partially pressing inputs will reduce intensity. A fancy graph shows the effects on the emulated wiimote's position. Donkey Kong Country Returns expects wiimote and nunchuk to be shaken in opposing directions which can now be achieved with a negative intensity value on either Wiimote or Nunchuk. Increasing the frequency to about 12 kinda seems to force it to work as well which is why it used to work. Shake inputs now affect IR data. Only problem I have is that it looks a bit weird in SMG with the IR now affected by shake, could this be made toggleable? Love the net negative line-diff! Code seems fine (apart from that one mention), untested. @Miksel12 Shaking would affect the cursor in real life. :P You can configure just the Y axis (forward/backward) to induce minimal cursor movement. SMG still detects shakes on just Y. You can also reduce the intensity down pretty low for many games. I'd rather not clutter the UI with another option if it's not really needed. That is understandable, the auto hide function also alleviates the problems for the most part so it's not a big deal. Edit: Using only nunchuck shake is also an easy solution. Retested and seems good. People will need to get used to certain motions being more logical though, like shake affecting IR position.